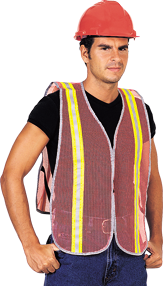 Class 2 approved yellow vest with 2” silver vertical and horizontal stipes. Front zipper. Inside ID pocket. Available in sizes L, XL, 2X. stripes give it excellent visibility. Front ID pocket Marked “CONTRACTOR” in front and back. One size fits all. Same as above, marked “SECURITY” in front and back. PVC Coated nylon mesh with reflective lime stripe. fluorescent blaze orange nylon mesh. Very cool, comfortable, light weight, durable and economical. Weighs four ounces. 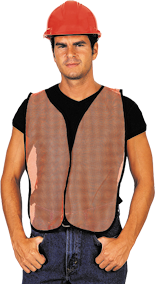 The vest is 18” in width and 48” long. It has a Velcro front closure with side ties. Same as FV-1 with silver retro-reflective stripes front & back. 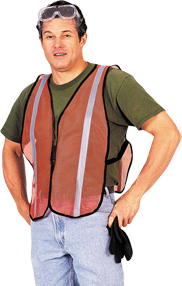 Nylon vest material with 11⁄2" 3M lime/silver vertica stripes, & 3M silver binding, has velcro sides, velcro front, horizontal. 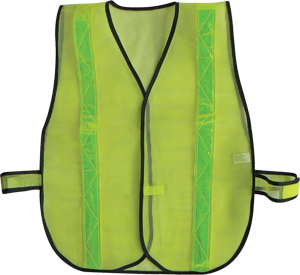 Made with 7.5 vinyl coated polyester mesh for high strength, yet light weight. It is made out of high tensile strength flexible knit which makes it tear resistant, and is 1000 denier and has good flexibility. 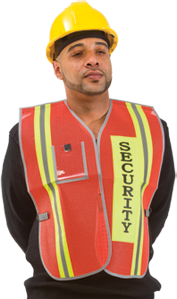 Its high visibility florescent red/orange gives it excellent daytime visibility and 2 reflexite lime/yellow reflective stripes 13⁄8", full length front and back gives it excellent nighttime visibility. 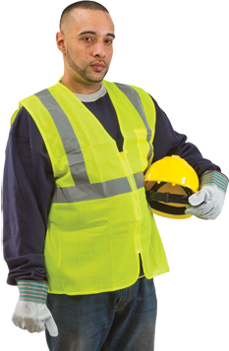 3" velcro closure is extra length for better closure & its 3⁄4" x 81⁄4 side elastics are made for extra large capacity, to accommodate workers with larger frames. It is U.V. resistant and does not break down under sunlight.